OBJECTIVE: Biological heart prostheses tend to degenerate. Patients live longer with more comorbidities. Redo open valve surgery may be harmful, valve-in-valve implantation has turned out to be an alternative treatment solution. Transapical approach may still be an option. Transesophageal echo gives additional guidance information. METHODS: A multi morbid, cachectic male of 72 years was referred with degenerated mitral valve prosthesis following two previous surgeries: CABG and mechanical aortic valve, replaced by a biological aortic valve together with a bioprosthesis in the mitral position. CT reconstruction was performed to plan the procedure. An apical approach was chosen, and a balloon expandable valve was introduced into the biological prosthesis without pre dilatation. Upon deployment the catheter valve embolized into the ventricle, half way expanded. The guide wire was kept in place, but no big enough sheaths for extraction were available. 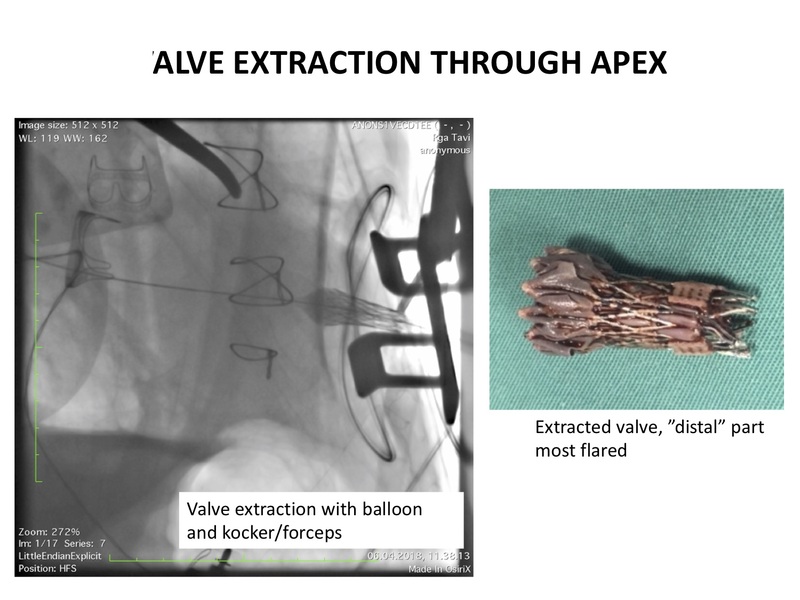 The catheter valve had to be manually extracted through apex with forceps. RESULTS: Another TAVI valve was introduced and successfully deployed. There was no paravalvular leak and the transvalvular gradient was 3 mmHg. The patient was extubated in the intensive care unit 3h later with stable haemodynamics.